Say "trick or treat" and target any town vendor, they will give you a treat, or a trick! The Britannians are once again growing pumpkins in their fields. Beware of the big ones, some don't turn out so friendly! We hope you enjoy the activities. Act 2 is coming soon. Tycho, Duque, Tanya and 12 others like this. Harvest Wine 2009 <--- wtf? Last edited by Jay-Renai Nyleve [SHS] on October 13th, 2018, 2:03 am, edited 2 times in total. Duque, ortiz, medamaude and 3 others like this. Bongos, Duque, The Silvertiger and 3 others like this. Selene wrote: Trick or Treat! Thank goodness, the reward center in my brain was just starting to grow back to normal size. Time to pulverize it again! Duque and Calvin like this. Will there be a vendor fair area this year also? So I'm wondering with pulling out all the deco from OSI for trick or treat this year, will we be doing skeletons next year. andyccd wrote: Anything good in Grimm? All I've gotten is carving pumpkins and carving kits. Where does giant pumpkin deed drop from? 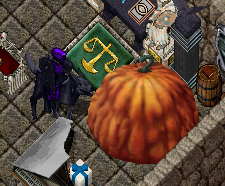 trick or treat, you need GM begging to get the good rewards from it.